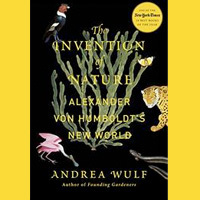 Join the Webster University Book Club on May 13 for a discussion of Andrea Wulf's take on a giant in the history of science in her book, "The Invention of Nature: Alexander von Humboldt’s New World." This far-reaching biography tells of von Humboldt’s scientific exploration, new ideas of science, prolific writing, and immense influence on politicians, artists, scholars, and scientists. Adjunct faculty member Paul Stroble will lead a discussion of the book on Monday, May 13, at noon in the Library Conference Room. Stroble teaches philosophy at both Webster University and Eden Seminary, and has written over 20 books. Everyone is welcome, and there are several copies of the book on reserve at the front desk of the library. For most of his life, explorer and naturalist Alexander von Humboldt (1769-1859) was a household name. Never just a simple collector or adventurer, he poured out his ideas in lectures, conversations, and books that made him the public face of science during his era. In this fine account of an unbelievably energetic life, British commentator and historian Wulf (Chasing Venus: The Race to Measure the Heavens, 2012, etc.) emphasizes that his insights marked the end of the universal view (at least among scientists) of animals as soulless automatons and the belief that humans were lords of the Earth. He ushered in the modern era of natural science, including—although he usually gets little credit—environmentalism. Humboldt, writes the author “saw the earth as a great living organism where everything was connected, conceiving a bold new vision of nature that still affects how we understand the world.” The son of a wealthy Prussian aristocrat, he used his money to finance his iconic, grueling 1799-1804 expedition through the jungles and mountains of Latin America, ending with a long visit to President Thomas Jefferson, a lifelong correspondent. He eventually returned to Europe, wrote of his experiences in 34 bestselling volumes, and continued to travel, lecture, write, and excite artists, poets, scholars, and scientists for the remainder of a very long life. Wulf pauses regularly for chapters on other great men who acknowledged Humboldt’s immense influence, including Goethe, Simón Bolívar, Charles Darwin, Jefferson, Ralph Waldo Emerson, and Henry David Thoreau. Humboldt was the Einstein of the 19th century but far more widely read, and Wulf successfully combines a biography with an intoxicating history of his times.